Hamsters first became pets about 70 years ago when discovered by a zoologist in a desert in Syria. They are nocturnal creatures -- normally awake only at night. This results from the hamster being born into environments such as deserts where it's too hot to be active during the day. Hamsters can, however, become so active at night that they become a nuisance to owners. Understanding how to deal with a hamster can prevent problems with conflicting sleep schedules. Set up the hamster's cage or habitat in an area of the home that is removed from bedrooms. This will eliminate some of the noise factor when the hamster is up and busy. The best location will be neither too warm nor too chilly for the hamster and will be out of direct sunlight. Better yet, choose a dimly lighted area. Choose a quiet hamster wheel for your pet's cage. Hamsters are active little creatures and, to keep one healthy, it must get sufficient exercise. Problems can arise however when the hamster goes for a middle of the night jog and wakes up the human residents of the home. To keep this problem to a minimum, choose the hamster wheel carefully. Some companies even make silent exercise wheels for just this reason. 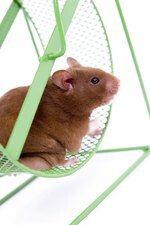 If your hamster wheel becomes squeaky, add some vegetable oil to smooth out the ride and quiet the sound. 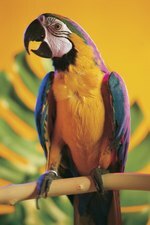 Provide your hamster with plenty of safe items to chew on such as dog bones, pesticide free twigs and cardboard items. If your hamster chews on the bars of a metal cage making loud noises at night, you can buy a spray that is meant to keep hamsters from gnawing. It is safe for the hamster and typically made of apple cider type products. Switch up the hamster's schedule. If you really want to control how your hamster responds to day and night, place the hamster in a normally dark room and with lighting timed appropriately, reset the animal's internal clock. A good example of a lighting schedule would be 13 hours of light and 11 hours of darkness. Keep in mind the darkened hours will be the hamster's active time.